A hat-trick by captain Adam Stafford helped Wyre Juniors to their second win of the season in the Blackpool and District Youth League’s Under-13 competition, beating St Annes Diamonds 6-1. Diamonds had won this season’s other two matches between the sides, but Wyre responded with a deserved victory in a match switched to their home ground because the St Annes venue was unplayable. 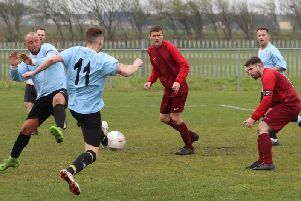 Delighted manager Michael Ward felt his Wyre side learned lessons from their previous match, marking the St Annes dangermen closely and using their own attacking strengths to play fine football through the midfield despite a difficult surface. A close contest looked on the cards when St Annes scored late in the first half to make the half-time score 2-1, Aladji Toure Sambou meeting Joel Sanders’ excellent cross with a pinpoint header. But Wyre were unfazed and controlled the second period as outstanding central midfielder Stafford completed his hat-trick. The other three goals were shared between strikers Dylan Copeland and Charlie Benn as the players behind them gained a grip in midfield. Copeland’s two goals included a spectacular effort from the right of the penalty area which looped over the defence. The pick of Stafford’s three was a skilful solo strike as he beat two before driving his shot home. With five games to play, Wyre manager Ward is hopeful of collecting some more wins. St Annes assistant boss Chris Ryder is also positive, saying: “We’ve had some good performances lately against teams in the top half of the table, so hopefully Saturday was just an off-day. St Annes’ star player was centre-half Akash Banerjee, whostayed solidly and never panicked, though the Diamonds back-line all impressed, even after Wyre got on top in midfield.